Walk around most any street in Peru, or attend a sports event and Beef Heart Anticuchos will be the snack you’ll most likely encounter. 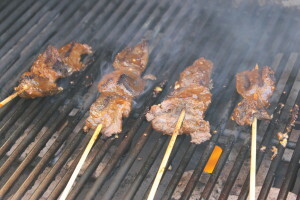 The slightly spicy, tangy meats on a stick are a favorite of Peruvians. They are so easy to make, and utilize a part of the animal most wouldn’t consider. With a quick marinade in ahi panca sauce, these tasty bites only need a skewer and a few minutes on a blazing hot grill. I’ve created mine using venison heart. This snack is quick to make and so yummy, you can make this your first meal while still out in the field. 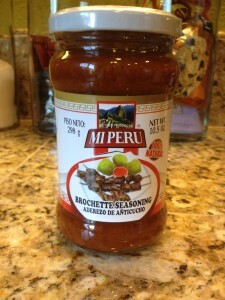 Jars of Aji Panca sauce are available online or in most Hispanic grocery stores. If it isn’t available, a paste can be made by using 2 dried aji (“a-hee”) peppers and a bit of oil. I found this jar at my local Hispanic grocery store. 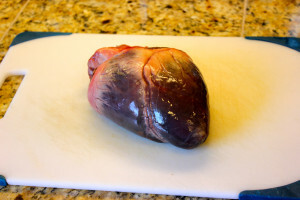 Start with a venison heart. Remove all fat, ventricles and split in half, then cut into thick slices. 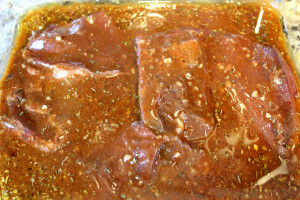 Add to marinade and refrigerate for 2-3 hours. Then skewer the meat. Sear on a very hot grill, 1-2 minutes each side, and brush with the leftover marinade as you turn the meat over. Serve with extra sauce. The traditional side dishes are boiled sliced potatoes and corn on-the-cob. Walk around most any street in Peru, or attend a sports event and Beef Heart Anticuchos will be the snack you'll most likely encounter. 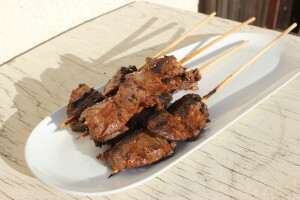 The slightly spicy, tangy meats on a stick are a favorite of Peruvians. They are so easy to make, and utilize a part of the animal most wouldn't consider. With a quick marinade in ahi panca sauce, these tasty bites only need a skewer and a few minutes on a blazing hot grill. I've created mine using venison heart. This snack is quick to make and so yummy, you can make this your first meal while still out in the field. Soak wooden skewers in warm water, and set aside. 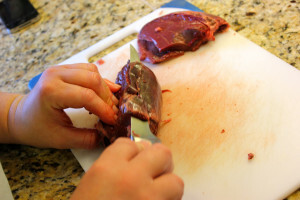 Remove any fat and silver skin from the venison heart. Split the venison down the middle and remove the ventricles. Once the venison is trimmed, slice into 3 inch pieces. Add all the ingredients into a glass dish, or a heavy duty zip lock bag. Add the venison heart pieces. Place in the fridge or cooler for 2-3 hours. Heat the grill to about 400 degrees. Sear for 2 minutes, then baste with marinade. Flip meat over and grill 2 more minutes, and baste once more, *be careful not to overcook the heart, 4 minutes total is all that is needed. Boil remaining marinade for 5 minutes, and serve with venison anticuchos. Side dishes can be grilled corn on-the-cob and boiled new potatoes.